The “Black Blocs” represent a challenge to the system and the larger Occupy movement itself. And although the corporate media are already painting the violence as “reprehensible” and “unacceptable”, and many Occupy groups committed to nonviolent protest seek to distance themselves from those who choose to express their pent-up rage in more aggressive ways, “the hooded unknowns” clad in black may be simply ahead of their time. 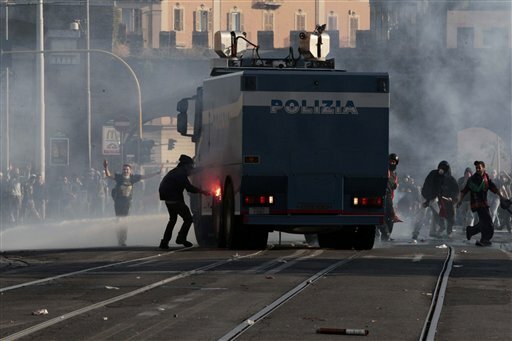 Rome demonstrators burn a police van on October 15. Their tactics present a dilemma for the nonviolent movement that may resonate with greater force as more protesters around the world increasingly clash with a system determined to maintain business as usual while practicing selective repression and cosmetic reforms. (Rome) Last October 15, up to 200,000 Italians marched in Rome in the name of change, under the vague aegis of the “Movement”. Young and not so young from all corners of the country marched in the direction of the huge Piazza San Giovanni where Italians traditionally hold political manifestations. October 15 was a landmark of the new Resistance spreading in Italy, on the one hand in imitation of Occupy Wall Street, on the other hand a kind of summing up of the air of not completely non-violent protest infecting the country. Contrary to elsewhere, the state TV network, RAI 3, covered the entire half day of the events from shortly after noon until evening so that the entire nation could follow the demonstration from its beginning to its bloody end, which was the second anomaly: the transformation of a non-violent demonstration into extremely violent guerrilla warfare so that few of the marchers ever reached Piazza San Giovanni. Though there were some 120 casualties, government spokesmen seemed pleased—or disappointed—to announce that there were no deaths. To view the example of urban warfare as it happened was like viewing an insurrection. Following the script of similar manifestations throughout the world on October 15, Rome’s planned non-violent manifestation was infiltrated by from 500-1500 violent, self-proclaimed revolutionaries who were mixed among the huge formations of singing and chanting non-violent marchers. In a well-planned and coordinated action the organized violent infiltrators overcame both police and the peaceful demonstrators alike and stormed and devastated the city center, spreading fire and destruction. Agents provocateurs? Berlusconi’s men? Black Block? Or anarchists from the Social Centers in most Italian cities? Perhaps the identity of the masked and hooded infiltrators wearing gas masks comprises something of all. The insurrectionists are also called i Neri, the Blacks, because of their dark clothes. For the government, the October 15 violence is a revival of the air of the 1970s and 80s and the infiltrators incarnate the spirit of the terroristic Red Brigades, last century Europe’s most successful terrorist organization. RIGHT: Police fire tear gas. In any case, as of today the government is benefiting from the violence. 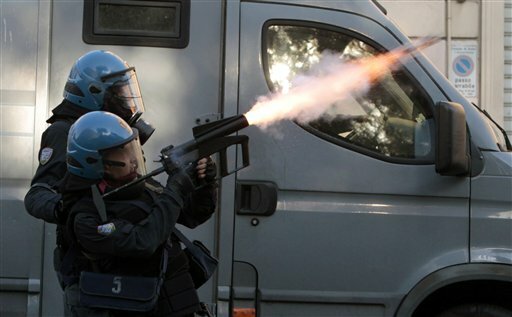 Police raids and house searches are underway in cities from north to south, from Turin, Milan, Padua and Bologna to Florence, Rome, Naples and Palermo. Numerous arrests have been made, some persons facing up to 15 years prison, while loud voices demanding more stringent laws are arriving in perfect timing. The Movement fears that for the government violent and non-violent protest are considered one and the same and that a general crackdown on all organized protest is likely. Right or wrong, the Rome events of October 15 demonstrate for the world to see the other side of the coin of the meaning of resistance of which everyone should be aware. The real reality is that in Italy, deeply entrenched power is no more likely to agree to the non-violent Movement’s demands for real change—for tight control over financial institutions, for equality in the fiscal structure, for the maintenance of social programs, for employment-creating economic planning—than is Italy’s neo-fascist criminal Prime Minister Silvio Berlusconi likely to resign and make way for change on a government level. The Blacks are most likely ahead of the times; yet, in Italy, they have moved the hands of the clock ahead. They represent a growing part of society that does not believe that non-violent sit-ins will suffice to bring about the systemic change on everyone’s lips. Senior Editor GAITHER STEWART serves as The Greanville Post‘s European Correspondent. His latest novel is Time of Exile, third part of the Europe Trilogy, soon to be published by Punto Press. Posted in AMERICAN BRAINWASH, ANNOTATED NEWS, CAPITALISM & SOCIALISM.